UISG president Sr. Carmen Sammut said in a video statement Friday that the sisters at the audience with the pope “were quite excited by the fact that Pope Francis did not leave any question out." "He really wanted to answer each of our questions," said Sammut. “He was very strong about the fact that women should be in the decision-making processes and the decision-making positions of the church." 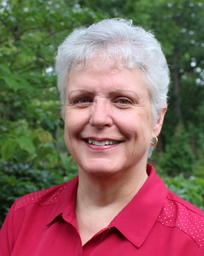 Regarding the question on the possibility of women deacons, the UISG president said her group "had proposed that there would be a commission." "He accepted that proposal and has said that he would bring that forward so that it could be studied even more than it has already," said Sammut. "And I hope that one day there will be a real decision about this." "Vatican Tamps Down Expectations Over Women Deacons", But, Scholarship Supports Female Deacons as Equal with Male Deacons, Check it out! German theologian Ida Raming and theologian and archaeologist Dorothy Irvin. Indeed, Pope Francis has opened a hornet's nest at the Vatican! opening up this topic for study. They fear that it could lead to women priests! Yet, I believe that Pope Francis' Commission is a positive first step and could lead to the full equality of women as priests, bishops, and decision makers in a more inclusive, egalitarian church. VATICAN CITY — "The Vatican is tamping down any expectations that Pope Francis is about to let women serve as deacons in the Catholic Church anytime soon. Francis made headlines Thursday when he told a closed-door meeting of some 800 superiors of women's religious orders that he agreed with their proposal to create a commission to study the issue. He was responding to a question about what was impeding women today from serving as deacons, who aren't priests but perform many of the same functions as priests, such as presiding over baptisms, marriages and funerals. Francis replied that he understood that women deacons in the ancient church weren't ordained, as male deacons are today, and he reaffirmed that women regardless cannot deliver homilies during Mass. 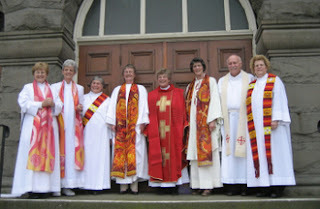 But he agreed to set up a commission to study the question, especially the role of women deacons in the ancient church. The Vatican spokesman, the Rev. Federico Lombardi, told Vatican Radio on Friday that the pope "didn't say he had any intention of introducing diaconal ordination for women, much less priestly ordination for women." when a little pretty white girl ran into a black man's arms." a “dead giveaway” that something was seriously wrong. “I’m a Christian, an American. I am just like you. said he bore no hatred toward his captors. "I don't hate anybody," he told reporters. and I intend to do that." will not be what we Americans think of as white. Right now, the majority of the world is not white. In fact, whites make up just 16% of the global population. And the majority of the world is not Christian. and Muslims are second at 22%. that they are lashing out in anger. they try to blame people who are different from them. sometimes it seems as if the Spirit has gone out of it. is being shattered by our greed. hunker down in fear when they see a police car coming. by the hateful and vicious bigotry in our political campaigns. from coming into the country. Is the Spirit still with us? will be hearing today's Pentecost readings. Will they accept the message there for us? The followers of Jesus were all in one place together. that we might encounter someday after we die. were huddled in a locked room. our politicians would live those words. What if they followed the Spirit? What if they listened to Pope Francis? is not a true Christian. This is not in the Gospel." to share Jesus' good news? What if they listened to Dorothy Day? simply by words or demonstrations. and the 1for3 water project. living lives of dedication to serving others. Our oxytocin level is sky-high! The Spirit is indeed alive here! as we go through the turmoil of this election season. and all that goes with it. to state Supreme Court Justice down to County Commissioner. We'll look at the issues. 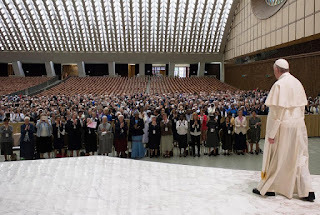 On May 12th during an audience with 900 women religious from the International Union of Superiors General, Pope Francis said it would be good to establish a commission to study the possibility of "reinstating" women deacons. This could be a first step to the full equality of women as priests and bishops in a renewed priestly ministry in a community of equals. It is clear from contemporary scholarship that Scripture affirms that Jesus treated women in his community not as subordinates but as equals. Women deacons, like Phoebe in Romans 16, played a major leadership role in their communities. 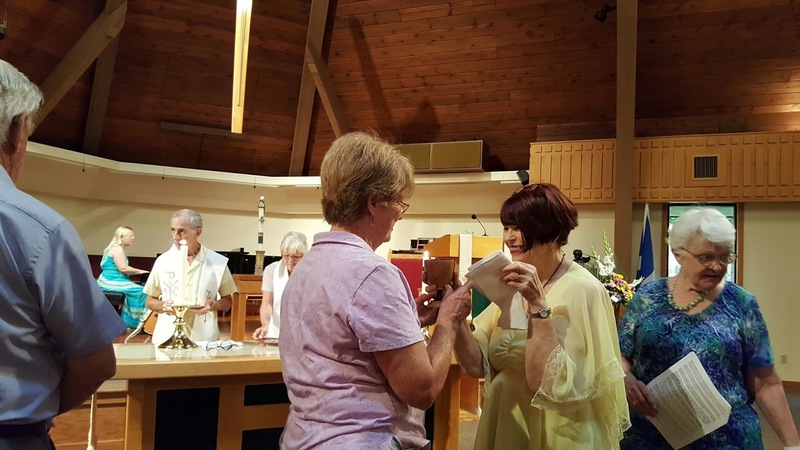 The Roman Catholic Women Priests International Movement (on 5 continents, 13 countries, and serving 81 faith communities in the U.S.) is leading the way to a renewed priestly ministry in an inclusive, egalitarian church where all are welcome to receive sacraments. 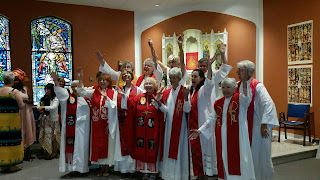 Woman Priest Janice Sevre-Duszynska will deliver the responses to the following Petition to support Women Priests on June 3rd at the Worldwide Jubliee to Celebrate Women Priests. The petition asks Pope Francis to lift the excommunications against women priests, and our supporters and to dialogue. All are invited to sign the petition. "Catholics all around the world are served by the faithful actions of Roman Catholic Women Priests, who lead inclusive worshipping communities and live out Pope Francis' "Church of Mercy" every day. However, these priests have been excommunicated simply for following their call. Pope Francis-we are Catholics and people of faith and goodwill who support women priests, because they have changed our lives for the better. Hear our call, and lift the unjust excommunications of these priests and their supporters." Enter, O Spirit Feminine, enter! Cast your beam of brightness! Enter, O Mother of the poor! Enter, spring of all our keep! Enter, within our heart do shine! Nothing free from stain of wrong. Guide the steps that have been lost. O gracious Mother, Let it be. Pope Francis Agrees to Open Commission to Study Women Deacons, A First Step to the Full Equality of Women including Priests and Bishops in An Inclusive, Egalitarian Church? 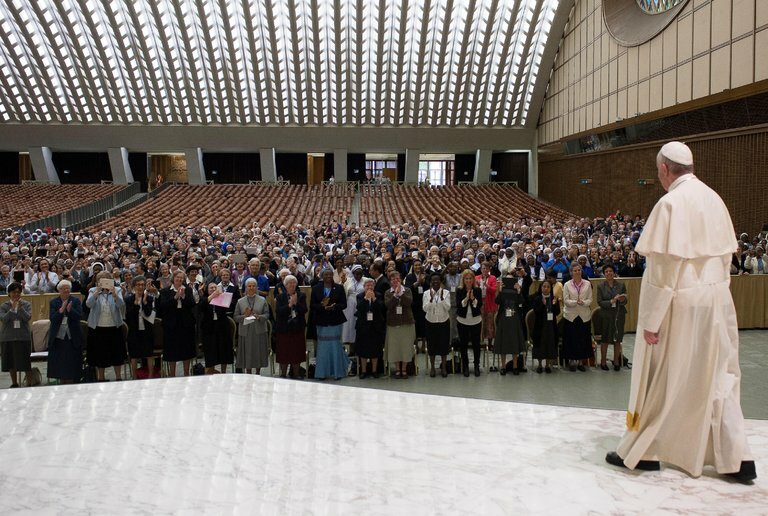 Today during an audience with 900 women religious from the International Union of Superiors General, Pope Francis said it would be good to establish a commission to study the possibility of "reinstating" women deacons. This could be a first step to the full equality of women as priests and bishops in a renewed priestly ministry in a community of equals. It is clear from contemporary scholarship that Scripture affirms that Jesus treated women in his community not as subordinates but as equals. 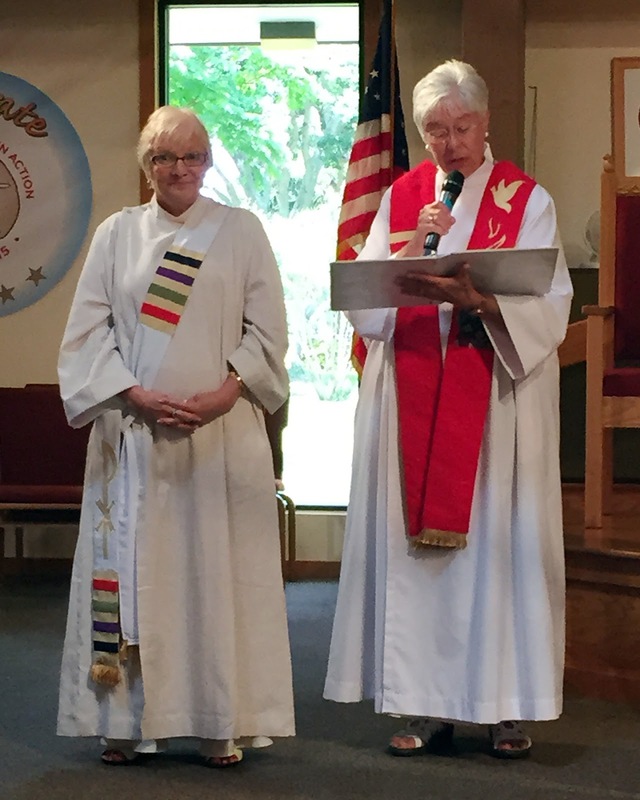 Women deacons, like Phoebe in Romans 16 played a major leadership role in their communities. 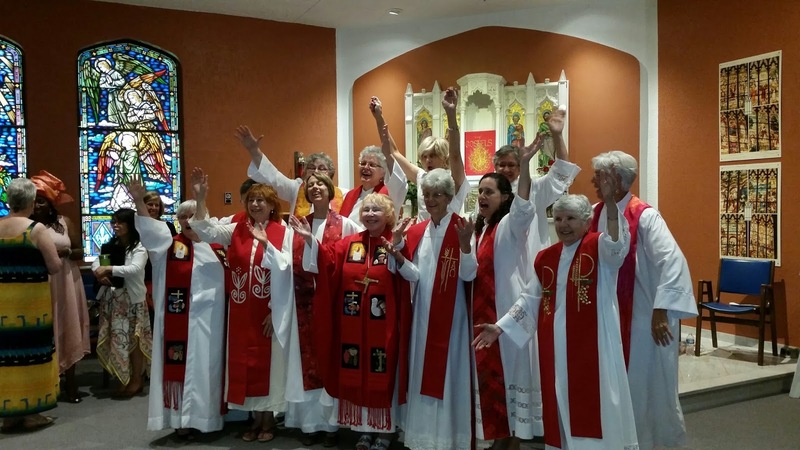 The Roman Catholic Women Priests International Movement (with 225 members on 5 continents, 13 countries, and serving 81 faith communities in the U.S.) is leading the way to a renewed priestly ministry in an inclusive, egalitarian church where all are welcome to receive sacraments. I disagree with Pope Francis' position that a woman cannot be in Persona Christi, and thus, cannot preach or preside at Eucharist. This argument is sexist and denies the spiritual equality of women. All the baptized are images of Christ created In Persona Christi. ..."The Roman Catholic Women Priests movement has ordained hundreds of women who are already ministering to the people of God around the world, yet their call to the priesthood remains unrecognized by top Church leadership, including Pope Francis. In just over two weeks, we will be delivering a petition to Pope Francis at the Jubilee for Women Priests, encouraging him to dialogue with women priests. We encourage all of our supporters to sign it at this crucial moment in Church history. " Catholics all around the world are served by the faithful actions of Roman Catholic Women Priests, who lead inclusive worshipping communities and live out Pope Francis' "Church of Mercy" every day. However, these priests have been excommunicated simply for following their call. Pope Francis-we are Catholics and people of faith and goodwill who support women priests, because they have changed our lives for the better. 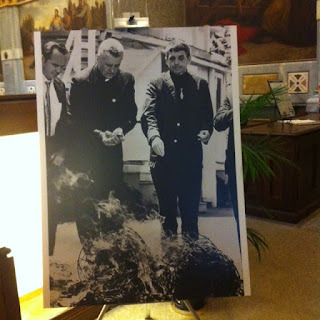 Hear our call, and lift the unjust excommunications of these priests and their supporters. Pope Francis says that "No one can be excluded from the mercy of God...[the Church's] doors remain wide open." Pope Francis has demonstrated his commitment to this mercy by reaching out to other orders of priests who have broken away from the church. In this spirit, we ask Pope Francis to affirm primacy of conscience for the women priests worldwide. 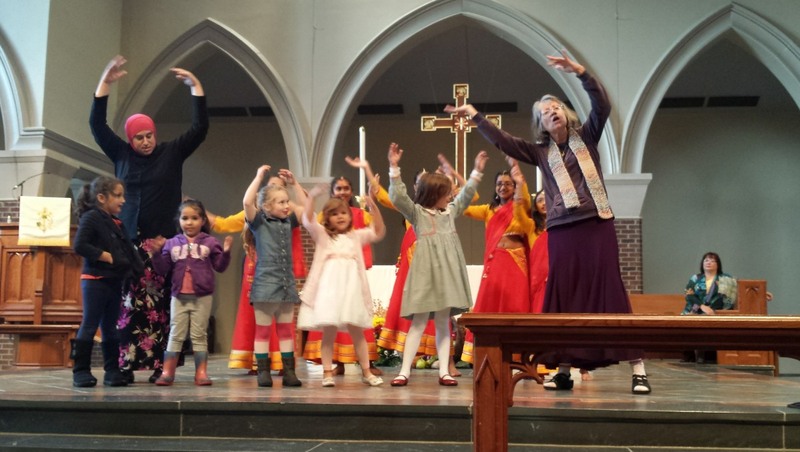 In prophetic obedience to the Spirit, women priests live a renewed priestly ministry in communities of faith that welcome all and exclude no one. Roman Catholic Women Priests, who stand in apostolic succession serve in a renewed priestly ministry in a community of equals. Those of us who are divorced and remarried, who are LGBTQ, and who have struggled with the Catholic faith, have found spiritual shelter in their worshipping communities. 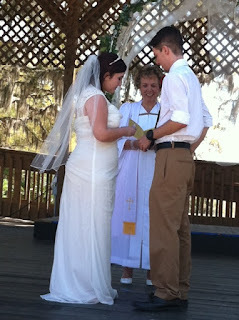 Here, we can fully participate in the Word of Jesus and the sacraments. They are living the Gospel message of radical inclusion. Pope Francis, you have inspired the world with your message of a merciful Church, and we now implore you to live up to your message. Use the power of your office to open wide the doors to dialogue and lift all excommunications and ecclesiastical punishments against Roman Catholic Women Priests and their supporters. We are the Church. Listen to our cry for justice. This petition will be delivered by a woman priest to the Vatican on June 3rd, during the Jubilee for Women Priests hosted by Women's Ordination Worldwide and the Women's Ordination Conference. 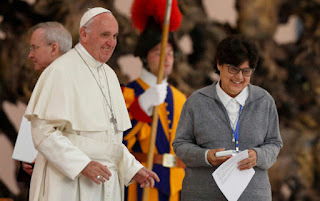 Rome, Italy: The Women's Ordination Conference (WOC) applauds the women religious of the International Union Superior Generals (UISG) for brazenly dialoguing with Pope Francis on leadership and ministerial roles for women in the Church, including the opening of the diaconate to women. In response to the sisters' questions, Pope Francis agreed to launch a Vatican Commission to study the diaconate to include women, stating: "It would be good to clarify this." Opening a commission to study the diaconate for women would be a great step for the Vatican in recognizing its own history. Decades of research on this topic has already been published by renowned feminist voices. WOC recommends that the Vatican's commission include the following scholars: Gary Macy, Dorothy Irving, Ida Raming, Sr. Christine Schenk, John Wijngaards, and Phyllis Zagano. Biblical evidence names several women deacons, working alongside men in the early Church including: Phoebe, St. Olympias, Dionysia, St. Radegund and St. Macrina. Such a commission, similar to the Pontifical Biblical Commission of 1976 that concluded there is no scriptural barrier to women's priestly ordination, could begin to restore the Gospel values of equality and justice. Pope Francis also stated that a woman cannot be in Persona Christi, and therefore cannot preach or preside over the Eucharist. WOC rejects this flawed interpretation that a male body is a necessary condition of representing the Body of Christ. Upholding this discrimination, as though it were the will of God, is simply indefensible. While WOC celebrates this step from the Vatican, until women are included in all decision-making structures and as priests and Bishops of the Church, equality remains painfully denied. May 22nd marks the 22nd anniversary of the Vatican's Ordinatio Sacerdotalis, banning all discussion on the ordination of women. WOC advocates that a new commission on the diaconate include discussions on priestly ordination for women in the Roman Catholic Church. 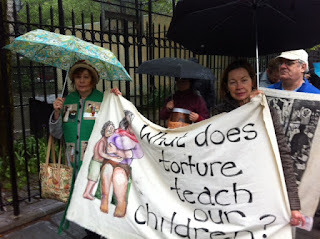 It was raining a downpour in New York City on May 6th as we joined the procession at Dorothy Day’s home, Mary House Catholic Worker on East 3rd St., to make our way with a brass band and banners to St. Francis Xavier Church on West 16th St. Drenched but full of spirit we were waking up the city at 7:30 a.m. to celebrate the life of Fr. Daniel Berrigan. I was marching with Anne Dowling, a friend from School of the Americas Watch, and my partner, Max Obuszewski. Max was a friend of Dan’s and did resistance with him as well as with his brother, Phil. 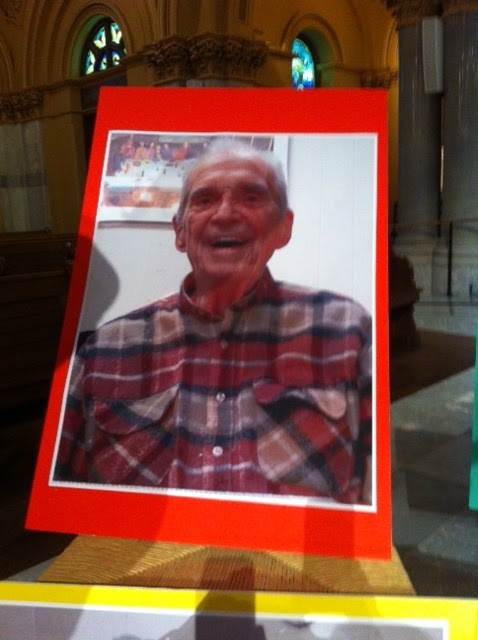 At Washington Square, wide eyed and smiling, we danced, marched and sang to show our gratitude for the life of this courageous pacifist priest, a mentor and guide to so many during his nearly 95 years. From across the country we came, Catholic Workers, peace and justice activists and from other walks of life, hugging each other. Many of us were elated to gather as friends who did resistance together to bring about the Beloved Community. “Didn’t we get arrested together?” we asked each other as we met. Once inside the church Max and I encountered hundreds and hundreds of people, many of whom were friends and fellow resisters. Once the memorial service began, however, how disappointing to see only one female dressed in white among the sea of male priests in white albs move up to the altar in this liberal parish. Who was she? Francis has announced the Year of Mercy! When is gender equality going to come in the Roman Catholic Church? When Dan Berrigan died, those of us in the women priest movement re-read his 1977 piece on women and women priests. He supported us. My eyes water, my heart stirs as I read Dan’s poem, “We Love,” at the beginning of the program: “What we love: there are not blades enough.” I recall reading his book about Daniel in the Lion’s Den while in federal prison and a few years ago Wisdom: The Feminine Face of God during our trial for our witness at the nuclear weapons plant in Kansas City, MO. It is the Gospel of John: 32-45 that is proclaimed. After Mary professes her faith in Jesus, he calls the dead Lazarus back to life. I am delighted that rebel priest, Jesuit Steve Kelly, is giving the homily. Before he begins, he wonders if any FBI agents are present and suggests that it’s time to close their case on Dan Berrigan. Laughter and clapping echo through the church! Steve has the reputation of being in and out of jail. Buckle in and get ready to hear the Spirit in Steve’s homily on live streaming! During the prayers of petition a woman addresses Dan’s support of women on the altar and the people in the pews approve, clapping uproariously! For Communion everyone processes through the center aisle. 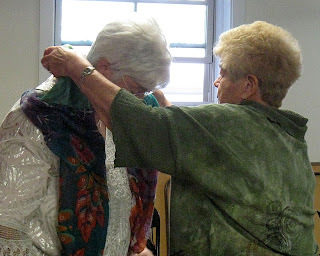 I had put on my stole this morning, green quilted with scenes from the Gospels made by a Colombian women’s prison cooperative. I wore it in Rome when I was detained by the Italian police during the Conclave in 2013 for “dressing like a priest.” I had been ordained five years! 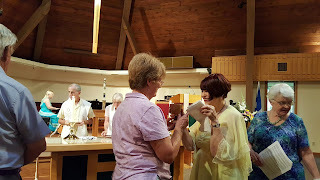 When I reached the front in the Communion line, it occurred to me that I might be denied Eucharist because I was excommunicated for following my conscience and being ordained. However, the eyes of the priest, John Cecero, smiled and welcomed me. What a blessing to be here! During the celebration the Berrigan family shared their memories of Dan and we listened intently. We were sent forth with Beethoven’s “Hymn to Joy” filling this glorious place abounding in the goodness of Dan Berrigan’s life and the love of those who knew him. What an unforgettable celebration of such a life-giving man! Although I never met Daniel Berrigan, he touched me through his writings and his actions. I have much to share about the celebration of Daniel Berrigan’s life with our women priest community and women priest friends and supporters, former Maryknoll priest Roy Bourgeois, founder of the SOA Watch, and Franciscan priest and peace activist, Jerry Zawada, who has been punished by his order for his support of women priests. Spirit of Love, your overflowing love permeates my being and all creation. May I love all with your tender love. Spirit of Compassion, your comfort embraces me and gives me strength in times of sorrow and stress. May I walk with those who are hurting and who need a friend. May I be an instrument of peace, in communion with all beings. May I affirm others through my words and actions. Spirit of Life, you are moving in me, in everyone and in everything. 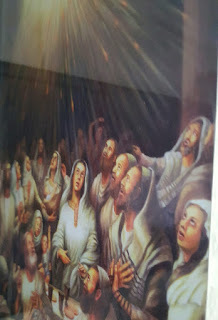 May I/we grow and evolve in Pentecost Passion and joy! The following lecture was given by Nausicaa Giulia Bianchi to present her documentary www.womenpriestsproject.org at the International Center of Photography on March 30th 2016 during the panel “Women in Photography”.